Foodies know that ingredients are as important as technique—whether it’s an expensive dinner entrée or a sandwich. So it’s no surprise that there’s always a lunch-time line at Beverly’s Wrapture, where the ingredients are fresh and top quality. On a recent sunny day, we snagged one of the café’s outdoor tables to enjoy some of the bounty. We ordered all wraps on this trip but noted several interesting bowls on offer, including asian, curry, and pad thai (all $7.50 without meat). There’s also a homemade soup that changes daily. 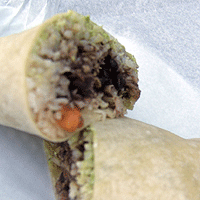 We’re big fans of the burrito with black beans, sour cream, salsa, jack cheese, and rice ($5.25). With the steak and guacamole we added, it was $7.50. The steak had great flavor, the combination was wonderful, and the wrap was big enough for two lunches. The junior member of our party ordered one of the day’s specials, the turkey club wrap, featuring cheese and crispy bacon. Another satisfied customer. We also tried the crabcake wrap, which was flavored with chipotle mayo and combined with onion, red pepper, corn, black bean, and romaine ($8.25). The crabcake was warm and tasted great, but we weren’t crazy about the corn/bean addition. The portabella mushroom with goat cheese, baby spinach, red peppers, onions, and roasted garlic puree ($7.25) was a success and a must-try for garlic lovers. On our way out, we admired two more wraps and were assured they tasted as good as they looked: the middle eastern with falafel and the gyro with tzatziki. We were told they were best on spinach wraps (other choices include plain, wheat, and sundried tomato). 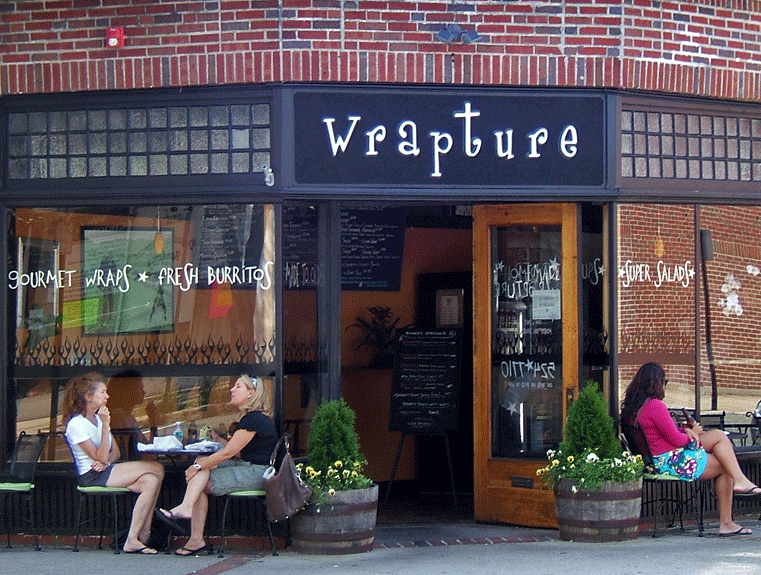 Wrapture, run by the folks who own nearby Soma, is certainly not the most cost-conscious choice for lunch, but if you don’t mind paying a dollar or two more for cooked-to-order, quality ingredients, it’s well worth braving the lunch line.